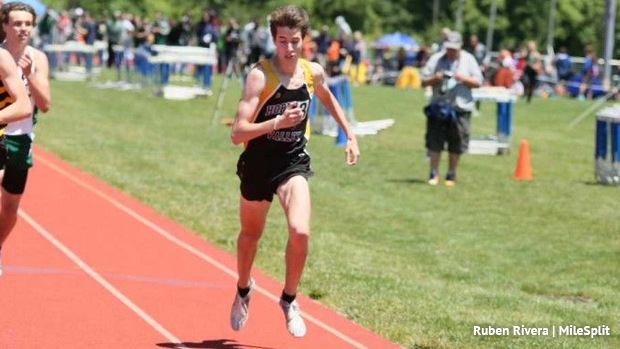 Sean Dolan's remarkable season continued on Saturday night with another dramatic last lap surge on his way to one of the fastest mile times in state history. Dolan, a junior at Hopewell Valley, was in sixth place at the bell in the adidas High School Dream Mile when he unleashed a 57.38 final quarter to rally for a runner-up finish in 4:08.86 at the adidas Boost Boston Games at Henry G. Steinbrenner Stadium on the campus of the M.I.T. in Cambridge, Mass. Dolan finished just behind Michael Phillips of Chiles High School in Tallahasee, Fl., who ran 4:08.03. Drew Maher of Shore Regional, the NJ Indoor Meet of Champions winner in the 1,600, finished sixth in 4:11.69. With his 4:08.86, Dolan climbed all the way up the state's all-time mile list into a tie for No. 12 with Craig Forys of Colts Neck, who ran his 4:08.86 in 2007. Dolan's time is the fastest by a NJ runner this season and is the fastest mile/converted 1,600 time run by a NJ runner since the legendary Edward Cheserek of St. Benedict's Prep ran 4:05.36 at the adidas Grand Prix meet on May 23, 2013 at Icahn Stadium in New York. Dolan is now within striking distance of the State Junior Class record and Mercer County record of 4:07.66, which were set in 2011 by Joe Rosa of West Windsor-Plainsboro North. This isn't the first time that Dolan has used his big kick to do something spectacular. Dolan cranked out a 57.76 last quarter on March 30 when he ran a then personal best 4:14.37 to finish first at the adidas Raleigh Relays at North Carolina State University to qualify for the Dream Mile. And then at last month's Penn Relays at Franklin Field in Philadelphia, Dolan came from way back over the final 400 and completed an epic comeback as he split 4:07.57 to briing his team across the line first in the DMR in a meet record and US #1 9:57.77, No. 3 in NJ history.